Nikki Haley jettisoned in approval when President Trump named her as UN Ambassador. I used to do a weekly hit on a radio station in South Carolina, and the host told me that then Governor Haley “loves you”, referring to me of course. Of course, I was flattered. I asked him to tell her that I too love her. Then a white kid shot up a black church. And things went bad. Remember when Dylan Roof committed that vile act? The man targeted a black church, goaded by the media to try to spark a race war. That’s what the media accomplished in the Era of Obama, as it encouraged America to divide down racial lines. Haley has a good record as a Conservative. She’s great on tax reform, and limiting taxes on cigarettes, for example. Haley has been strong on legal immigration, and stands fast against illegal immigration. 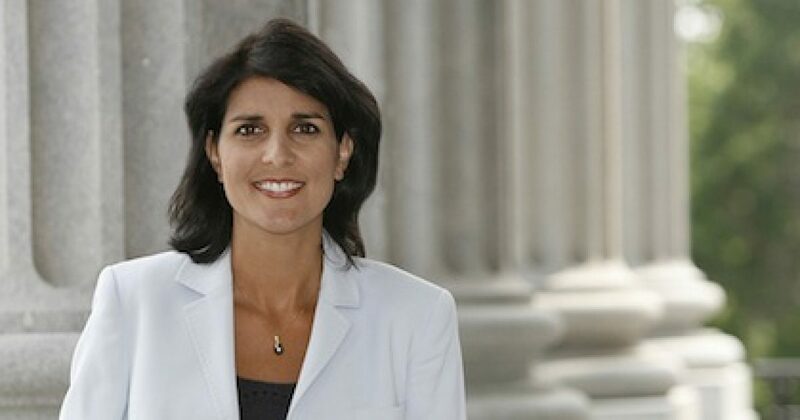 Haley has stated that, as a daughter of immigrants, she believes the immigration laws should be enforced. Thus, she voted in favor of a law that requires employers to be able to prove that newly hired employees are legal residents of the United States. That law also requires all immigrants to carry documentation at all times proving that they are legally in the United States. Haley signed an “Arizona-style” law cracking down on illegal immigration in June 2011. That law was challenged by Obama’s United States Justice Department on numerous grounds, such as claims the immigration law violates the Supremacy Clause. On education, Haley implemented a plan in which teachers’ salaries would be based on not only seniority and qualifications but also job performance. Teachers would receive evaluations and reports from principals, students, and parents. She’s pro-life, and I could go on with her Conservative credentials. But does she have the political savvy of Trump? Hopefully Haley has learned much under the tutelage of President Trump. If her career is to take the next step, she can’t have another Confederate flag fiasco.